Eutelsat and GSA signed an 18-year contract earlier this month valued at 102 million euros (about $110 million) covering the preparation and service provision phases for the European Geostationary Navigation Overlay Service (EGNOS) GEO-3 payload that will be hosted on the Eutelsat 5 West B satellite that is due for launch late in 2018. The new payload marks a replenishment of current EGNOS capacity and is scheduled to start service in 2019 for 15 years. EGNOS V3, the second generation of the EGNOS System, will implement a second protected frequency (L5) to offer to the dual frequency safety of life users a more robust and accurate vertical guidance service (increased robustness with respect to the ionosphere), according to the ESA’s EGNOS V3 Phases C/D – Summary Statement of Work. Version 3 of EGNOS will add a second frequency (L5) and a second GNSS constellation (Galileo) to the GPS L1 corrections currently being provided by EGNOS. 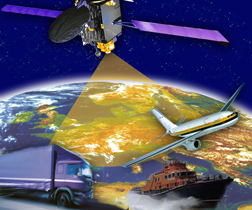 With the deployment of Galileo and the introduction of new capabilities in GPS, EGNOS V3 will offer improved Safety of Life (SoL) services to the civil aviation community as well as potential new applications for maritime or land users, thus showcasing the system’s increased potential to become a leading edge GNSS system in the future. The formal European Commission decision adopting the new mission objectives is the Commission Implementing Decision (EU) 2015/1183 of 17 July 2015 [RD-1], setting out the necessary technical and operational specifications for implementing version 3 of the EGNOS system. The EGNOS V3 Implementation also aims to improve the overall robustness of EGNOS services against increasing security risks, in particular cyber-security risks. The EGNOS V3 phase C/D is managed by ESA under the GSA EGNOS Exploitation Programme. It inherits from the study phases done under the ESA EGEP program and is based on the consolidated technical specifications emanating from the PDR. As the first step towards implementing EGNOS version 3 (V3), the contract ensures the continuous availability of the EGNOS Signal in Space (SIS) and smooth transition from EGNOS V2 to EGNOS V3. EGNOS operational messages are currently broadcast via navigation payloads on-board two GEO satellites, including an Inmarsat-3F2 satellite that is fast approaching end-of-life. The GEO-3 services will replenish the EGNOS SBAS payloads, guaranteeing EGNOS SIS availability and supporting the transition to the dual-frequency multi-constellation-capable EGNOS V3. The procurement process was a cooperative effort by the GSA and the European Space Agency (ESA), with the ESA responsible for the technical requirements of the service preparation phase and the GSA for the service provision phase. The ESA will continue to provide the GSA with technical support during the development of GEO-3. • ensuring the EGNOS message is relayed to the end-user. The satellite’s commercial Ku-band and EGNOS payload will be manufactured by Airbus Defence and Space, while Orbital ATK will build the platform. Eutelsat will also develop two redundant radio frequency (RF) ground stations to uplink the EGNOS message to the payload. It will also host EGNOS’ Navigation Land Earth Stations (NLES) in Rambouillet (France) and Cagliari (Italy), both of which will be co-located and connected to the RF ground stations. An EGNOS service notice was sent out to inform all EGNOS users that the GEO satellites broadcasting EGNOS messages are being changed. On March 20, the GEO satellite ASTRA-5B (PRN 123) was introduced in the operational platform broadcasting the operational Signal-In-Space (SIS), and on March 21, SES-5 (PRN 136) was moved from the operational platform to the test platform. EGNOS OS users equipped with non (E)TSO certified SBAS receivers should reassess equipment configuration to ensure that both operational EGNOS GEO satellites (PRN 120 and PRN 123) are used. More detailed information on EGNOS system status and performances can be found at the EGNOS User Support website https://egnos-user-support.essp-sas.eu. Users can subscribe to notifications about planned GEO outages and configuration changes and to real-time notifications of unplanned GEO SIS outages and recoveries in the EGNOS User Support website.